Condition: Good. Flattened. Remargined. Formerly mounted, text on verso partly disappeared. Minor oxidation. Verso: Spanish text. Large copper engraved map with contemporary colouring from the rare Spanish edition of the "Atlas Maior". 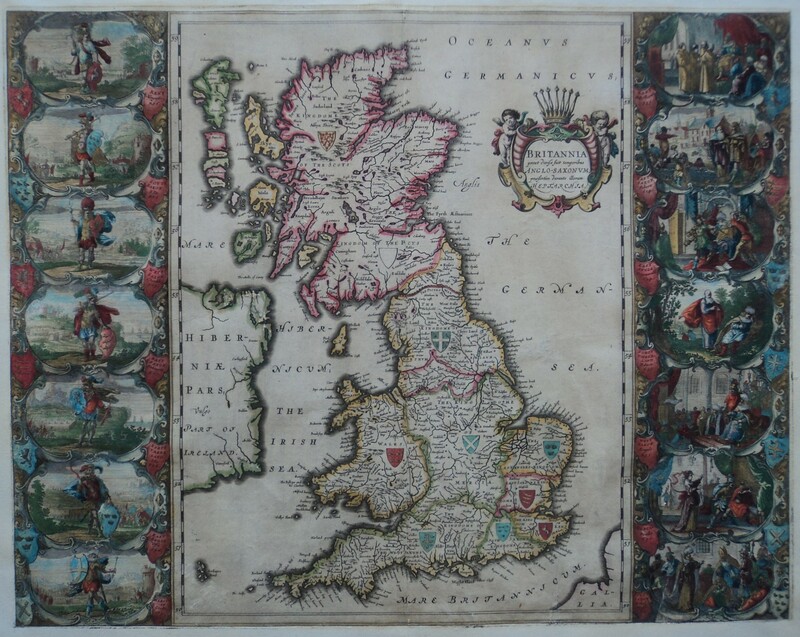 Elaborate vignettes depicting kings and scenes from Saxon history flank this magnificent map of Britain. The scenes are identical in subject matter to those used by John Speed. However they are presented in the dramatic, Dutch miniature style. The left border contains portraits of the earliest kings, while the right one depicts later kings in the process of conversion to Christianity. Included is a scene of Ethelbert receiving instruction from Saint Augustine and another of Sebert re-consecrating the temples of Diana and Apollo, now St. Paul's, London and St. Peters, Westminster. The map shows England, Scotland and Wales divided into the various Saxon kingdoms, each decorated with its coat-of-arms. A superb example of Dutch cartographic design and engraving.